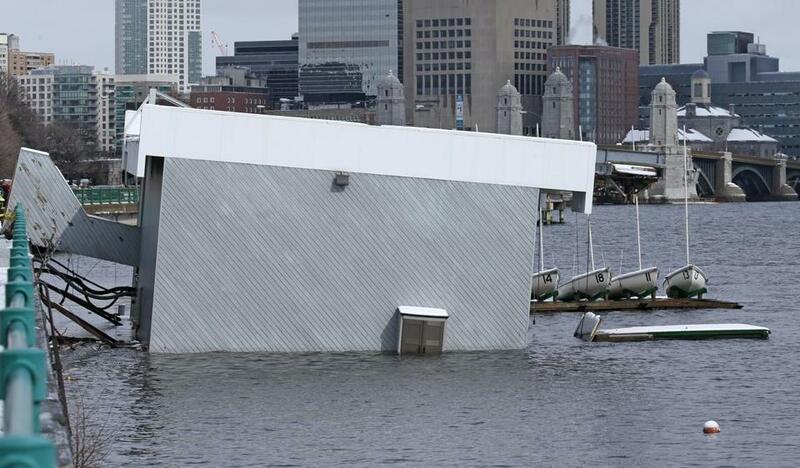 The two-story Harvard Sailing Center on the Charles River is slowly sinking in the wake of Thursday’s nor’easter. A compromised flotation device is apparently at fault, according to officials. The Harvard Sailing Center on Memorial Drive started “partially sinking” into the Charles River as a nor’easter swept the region Thursday. State Police spokesman David Procopio said that around 10 a.m. Thursday, police were alerted that the boathouse, which is used by Harvard’s Crimson Sailing Academy to store boats and equipment, was apparently dipping into the river because of a structural problem. The two-story center sits atop a barge on the Charles River’s lower basin, between the Longfellow Bridge and the Harvard Bridge, both of which connect Cambridge and Boston. It houses a classroom, locker rooms, a shower, and a kitchenette with a refrigerator, according to the Crimson Sailing Academy’s website. He said Harvard University Police Department officials, along with the Harvard Facilities Management Group, were on site to deal with the situation. No one was in the building when it began to sink, he said. Pictures and videos from the scene showed the right side of the sailing center dipping below the water’s surface. A Fox 25 reporter said “metal crunching” could be heard as the barge took on more water. Procopio said the problem forced police to close a single lane on Memorial Drive to allow the Cambridge Fire Department and others to assess the scene. The State Police Marine Unit was also dispatched, he said. Gerard E. Mahoney, Cambridge’s acting fire chief, said Harvard owns the building. He said the school was proactive in contacting the appropriate departments to notify them about the sinking structure.